Leadership Development seems to be on every organisation’s agenda. A Google search on ‘leadership development programmes’ reveals 14million entries. If you were thinking of getting some straight forward advice on how to develop the leadership capabilities in your organisation, you might wonder where to start or which way is best. Whilst leadership development seems new, it has existed in organisations for a long time. Thirty years ago it was called management development. The emphasis has changed from management to leadership with a change in what we expect from the people who lead our organisations today. Clearly there is a lot expected of leaders now with leadership behaviour being expected further down the organisation. Effective organisations need effective leaders. More importantly, organisational failures are often related to weak, ineffective or unclear leadership. So there is a strong emphasis on developing leadership skills. 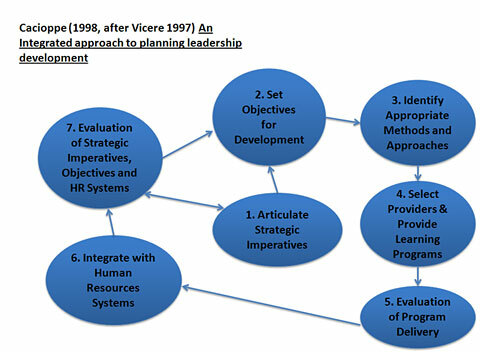 Ron Cacioppe’s integrated approach to planning leadership development (1998) which is printed on page 3, is an effective model to help plan your approach. Before deciding what elements a programme needs to include, he suggests articulating the key strategic objectives that are vital to the survival, success and growth of the organisation (Stage 1), and then setting the objectives for a leadership development programme directly from those key strategic objectives (Stage 2). Only when that has been done should you think about what activities to include in the programme (Stage 3). In our experience, many organisations start at stage 3, deciding which activities they’d like to run and go out to tender before they’ve fully considered the strategic context. At the other end of the programme, Cacioppe talks about giving proper time and thought to evaluation (step 7). Evaluation can be difficult and is often overlooked, but it’s vital to know how well the programme has worked before moving on. There are many ways to develop your leaders, often starting with some sort of ‘diagnosis’ in the form of a development centre or psychometric profiling, leading on to coaching, action learning sets, strategic projects, job rotation and other broadening experiences. There is no ideal format – it depends on the organisation’s needs, budget and other resources. Integration of the programme with management and HR systems will help development continue after the formal programme elements have finished. It’s also worth considering how to deliver your leadership development programme in the most time-effective way for managers. We are increasingly being asked to provide leadership development for busy managers who can’t be away from their desks for blocks of time. Technology offers many creative ways to deliver activities to manager’s desks so they can be completed in the most time-economic way. Do your homework and start by articulating your strategic objectives, before you decide what activities to include in the programme. That way you will ensure your leadership development programme contributes to the business objectives of your organisation. Be clear with people about what happens as a result of your programme. Failure to be clear will result in a lack of trust and buy-in to the programme from the people you want to benefit from it. A key question to ask is what if people don’t do well on your programme – how will you ensure it doesn’t affect their short and longer term career prospects? Involve your consultants – if you’re going to engage consultants to help with your programme, talk to them early and tell them about your strategic imperatives and objectives. Good consultants will be able to advise you on the sort of activities that can help you achieve your objectives. On occasion we have helped clients save money by advising them against costly activities that were unlikely to contribute to their goals. Don’t expect one size to fit all. Effective leadership development fits the organisation in terms of size, objectives and aspirations. Be wary of buying into ‘off the shelf’ programmes that may not fit your organisation well enough to achieve your goals. A bespoke leadership development programme will ensure you get what you need and could be a more cost effective option. Create interest with a launch event. It might seem obvious, but it’s important to launch the programme and create impetus and interest. Get your senior managers involved to demonstrate their commitment. It’s even more powerful to get your senior managers to go through the programme first, so they can model the leadership behaviours you want to develop. Has it worked? Evaluation is not everyone’s favourite subject – it can be difficult to quantify the results of a leadership development programme but it’s always worth the effort. Effective evaluation requires a commitment to collate and provide data after the formal programme is finished. Good consultants will be able to demonstrate different models of evaluation and should be willing to help you demonstrate the impact of the programme. Avolio, B J, and Chan A. The Dawning of a new era for genuine leadership development. In International Review of Industrial and Organisational Psychology, 2008, Volume 23. Bass B M and Riggio R E. (2006). Transformational Leadership, 2nd Edition. Mahwah New Jersey, Lawrence Erlbaum Associates.